What are Bhalaria Metal’s current offerings in the tableware segment? Bhalaria Metal has kept pace with the changes observed in the global markets. We have already developed various products made from stainless steel in innovative designs. We are successfully supplying the new range to our international and Indian customers. The most popular is the Mini Series which comprises of smaller versions of casseroles, pans, woks, etc. Our chip cups, nut bowls, serving bowls are also very popular. 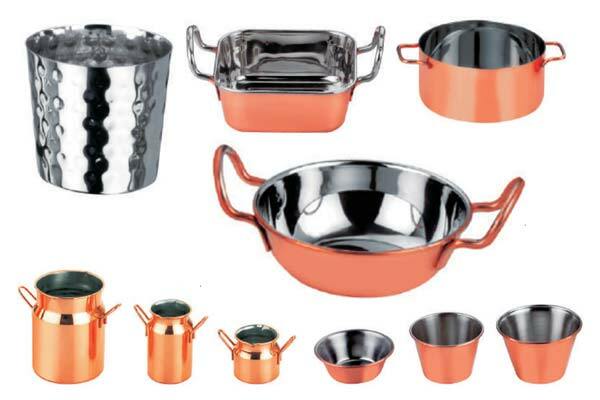 We offer different kinds of finishes to our stainless steel tableware products which include copper, vintage, rustic, etc. We have introduced various designs of cutlery aimed at different segments of the food service industry. Bhalaria Metal uses superior grades of stainless steel as raw material and advanced manufacturing and polishing processes which gives Bhalaria products an excellent finish and a long life, thus creating a value proposition for all its customers. Bhalaria Metal, along with its international customers which include some of the top tableware brands around the world, shall continue developing new products for the global and the Indian food service industry. Tableware is the key to the design and branding of a venue. The style of tableware not only influences the guest but also the chefs, as it gives them the tools to present food as per the style and the theme of the restaurant. The tableware industry has undergone a radical shift in recent times. The industry is set for an explosion and you can expect many innovations in terms of design and materials driven by changes in fashion, lifestyle, gastronomic trends, economic conditions and demographic factors. Globally tableware manufacturers are experimenting with different shapes, colours, materials, textures – anything and everything unconventional. There is an increased demand for visually appealing as well as functional tableware. Social media is also playing a crucial role in the choice of tableware for a venue. There are millions of posts on various social media sites and apps like Instagram, Facebook, Twitter, etc where people keep posting pictures of the food that they have ordered in a restaurant. Invariably, the tableware in which the food is served is included in the image giving viewers a peek into the style of the venue and influences the viewers whether they too would like to visit the place. Today’s consumer is aware about global trends and has increased disposable income. He aspires to replicate the fine dine experience in his home too, leading to an increased demand from the non-commercial segment. Earlier, Tableware mostly implied bone China, porcelain, glass and crystal. Usage of stainless steel was restricted to cutlery. But now the perception towards stainless steel is changing. Stainless steel offers many advantages over other materials and if chosen correctly, easily complements tableware of other materials. Some advantages of stainless Steel are that it does not break if dropped and is more durable as compared to other materials. Its finish lasts for years with minimal maintenance and is dishwasher safe. It is also very economical and cost effective in the long run.